Launched in 2013 by a small team of international yogis who simply wanted to offer people everywhere an easier way to find great teachers and studios, YogaTrail has since grown to become the World's Yoga Network. For yogis, YogaTrail offers something no other platform does: quick and easy access to all the classes from your favorite teachers and studios in one place (Your Class Guru). 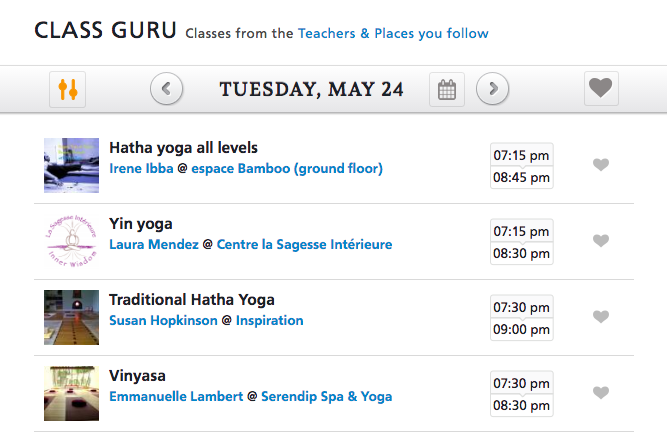 This means that when you follow a teacher or studio on YogaTrail all their classes are consolidated for you into a simple view. So you can check out schedules and plan your practice without having to open lots of different websites or Facebook pages. Classes get cancelled, teachers change their schedules, and lots of interesting events are springing up all the time. 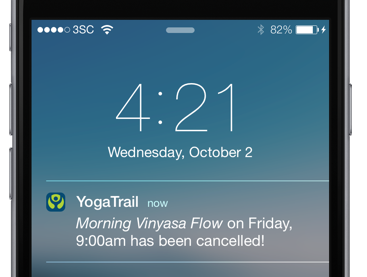 YogaTrail keeps you in the loop with notifications whenever any provider you follow on the site has some updates (class cancellation, new classes, new events, holidays, etc). You get all that directly to your inbox or even on your phone (with the YT Mobile App). With hundreds of thousands of yoga teachers, studios, and retreat centers, YogaTrail is also the most comprehensive resource for any one looking for yoga classes (public or private) and events － around town, or around the world. If you're travelling, it's the best way to find you yoga on the road. Thousands of yoga classes and events are posted every week on YogaTrail, so whether you're interested in taking a private class, seeing what local events are happening, or you're searching for the perfect yoga getaway, a teacher training, or even a big yoga festival －it's all there. YogaTrail is a community-powered platform. Yoga teachers and studios set up and manage their own profiles, and you can contact them directly with questions about their offerings. If your teacher or studio isn't on the site yet, you should add them! Inviting them will not only make YogaTrail a better resource for everyone else, but also will make YogaTrail work better for you. You'll get all their class info and updates at your fingertips so that planning your practice becomes easy! Lastly, we're working on making YogaTrail better everyday. Your comments and feedback help a lot, so please don't be shy: get in touch here.